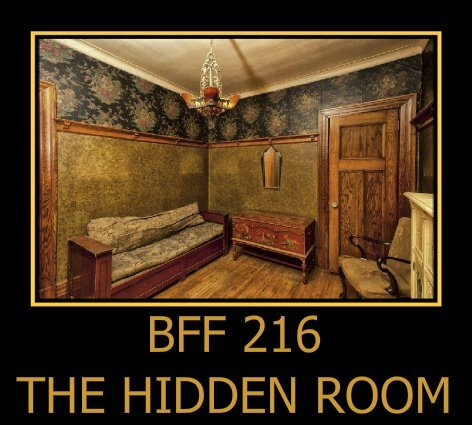 The hidden room was as much a part of my childhood as the monsters in the closet. To this day, I’m not certain my parents ever knew it existed. It took us so many places. 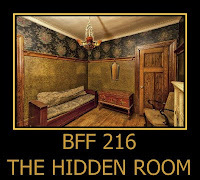 The room held our secrets. The room protected our souls when we slept. Some people think their homes have personality. Looking at the house from the front it’s easy to see the eyes, nose and a smile. But my home had a room with personality. I didn’t start out loving my hidden room. With some amount of accuracy, I think it is fair to say the room didn’t love me at first either. I base that on the conversations I have had, as an adult, with my parents. They spoke of closet doors flying open and hitting on the back wall. They spoke of creaking and groaning coming from my room, I know I didn’t do that. They said that at first they didn’t know if the house liked us. I grew to know, it is the hidden room that controls the house. With three kids and one on the way, my parents bought a new home. They made up the nursery, my room, all in greens. They hoped for a boy, but were wary none the less. Back then, it was a fifty-fifty gamble whether you got a girl or a boy. So, my room was painted a cool green with clown murals on the walls. Crying, standing in the crib, the small door inside my opened closet swung open. A gentle warm breeze wafted over my face, caressing. The breeze smelled of my mother’s perfume when she held me close. I stopped crying and breathed in the aroma. I knew then, I was not alone. Over the years, whenever I was sad I would crawl through the cubby hole door at the back of my closet, into the hidden room. It was small and comfortable, like a pair of arms enveloping me. It was cool in the summer and warm in the winter. How the house ever did that, I don’t know. I could take my stuffed bunny with me, Mr. Biggs, the room allowed one toy. I could talk to both Mr. Biggs and the room, they consoled me when I was sad and congratulated me when I was filled with joy. Taking a flash light was the only way to see in that room. It looked to me, that either my parents had painted my room to match the hidden room, or vice versa. I have often wondered. I never got direct answers from that room, but the scent and the breeze always let me know if I was on the right track. When I grew old enough and went away to college, my parents sold the house to a young couple expecting a child. I was glad for the room. I made a special trip home, just to say goodbye. Lovingly, the room had already changed it's color to pink. Your hidden room sounds like it was a wonderful place for a child. My secret place was the back of a closet under the attic stairs... I enjoyed your sweet story. Perspective is everything! Not the victim - but party to the change...thank you for taking the time to read my story.